This update increases the usability of the map. There is a new feature to measure distances from your current GPS-position to a point on the map for a fast approximation of alternate ways. The info fields on top of the map are only visible if you did not touched the display for more than 5 seconds. 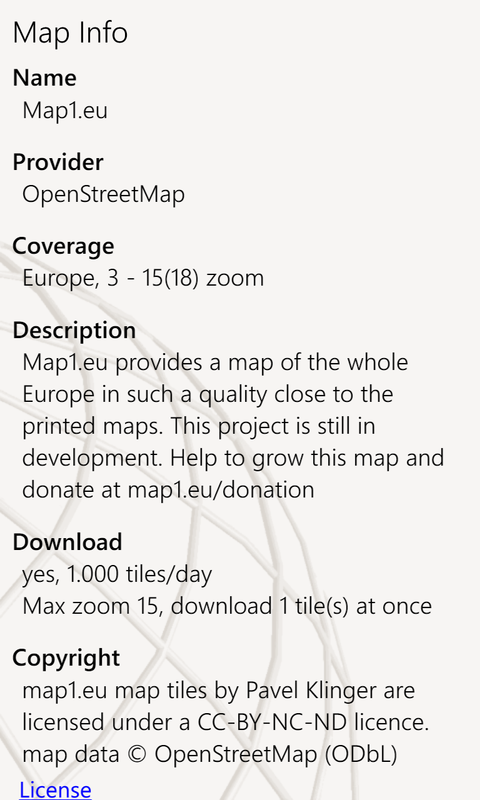 You can download your current map view for offline use directly from the menu. 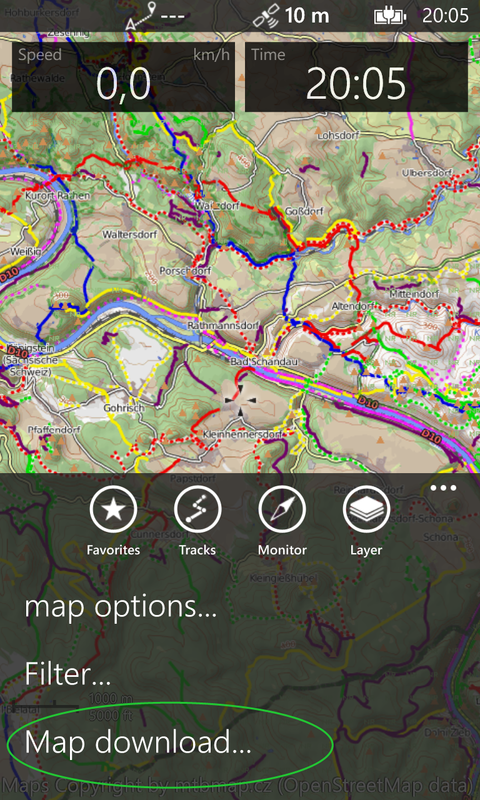 New map for bikers added to the regional online map catalog, MTBmap of Europe (mtbmap.cz). Measure distances on the map. A first step to the coming feature of hand edited routes. Download current map view directly from map. A small update of maaloo Outdoor is released. Two main features are added. The GPS-recording now runs in background, enabling the recording with another App in foreground. You can check your Mails or use a Messenger while the recording is continued. The next major new feature is the file association with .gpx-files. Open a .gpx-file from Mail or Cloud and the file will be opened with maaloo Outdoor to import tracks or waypoints. Here is a list of possible settings for your user defined map. 6) Edit all settings according to a map provider of your choice including all the letters, symbols and brackets exactly as shown. Close the page with the OK-sign. Nearly all map providers do not allow bulk downloads. 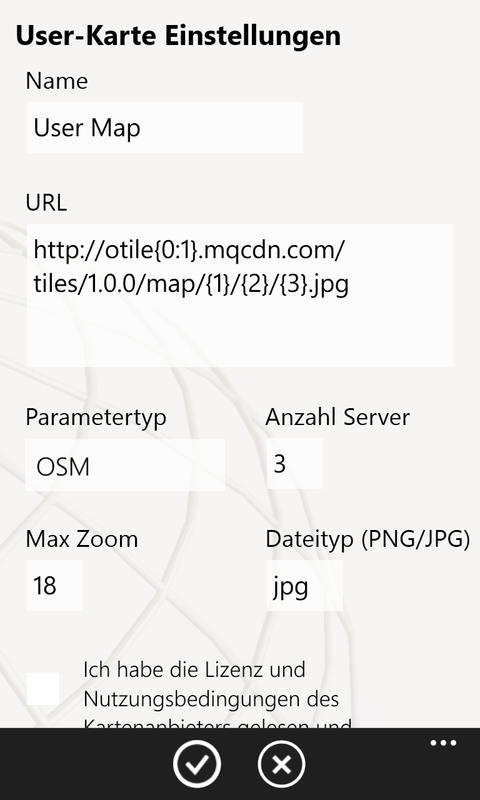 Do not download this maps, only use them for map browsing. A new star on the Windows Phone app market is born. maaloo Outdoor the successor of the already well known an favored app for Geocaching maaloo Geocaching. This app focus on the usual outdoor features like recording and displaying tracks and the management and locating of waypoints. This app has good features for offline usage like the ability to download outdoor maps for hiking or biking in areas without online access. This is the first version of maaloo Outdoor. Many features will follow. Here is a short list of the planned features for the next versions. This following features are implemented in version 1.0 yet.